April 2017 - Contemporary Controls' popular BAScontrol Sedona Unitary Controllers are now equipped for wide temperature operation. This upgrade allows the controllers to operate in ambient temperatures between −40°C to +75°C, making them ideal for both indoor and outdoor applications where drastic temperature changes would negatively impact any standard controller. Rugged metal design, low profile, and wide temperature operations make the BAScontrol family an ideal solution for various control, HVAC, and refrigeration applications such as RTU (Roof Top Units), FCU (Fan Coil Units), ERV/HRV (Energy/Heat Recovery Ventilation), WSHP (Water Source Heat Pump AHU), Boiler/Chiller Lead/Lag control, Lead/Lag Water Pump Station with Variable Flow Control, Heatpump AHU, Commercial Dryer Exhaust Booster, as well as Commercial Refrigerant applications. 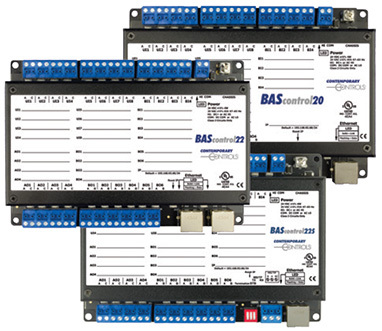 The BAScontrol Series of controllers supports BACnet/IP and Sedona Framework (SOX) protocols via an Ethernet connection. BACnet MS/TP is supported through a resident EIA-485 port on some models. A real-time clock with a super-cap backup allows for creating local schedules. These controllers are fully web page-configurable using a common web browser, and freely programmable using Sedona's drag-and-drop programming methodology of assembling components onto a wire sheet to create applications.